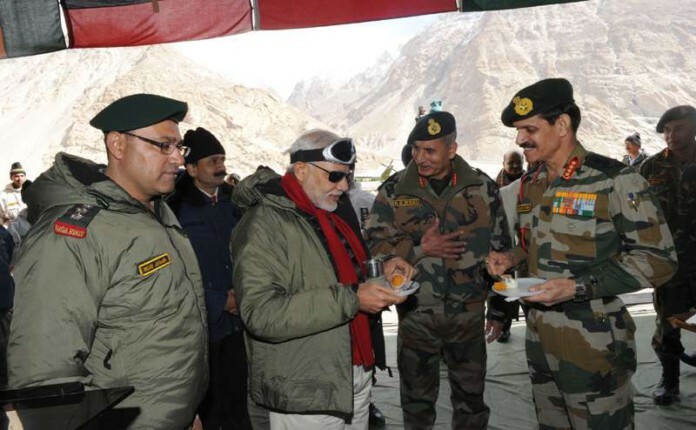 When Modi spare time to visit Siachen glacier in order to meet Army personals guarding the nation. Narendra Modi took action against Pakistan by referring the currency ban with ‘Loss because of neighbour nation’. Indian Prime minister addressing the nation in an emergency meet addressed that because of neighbour nations our country is suffering huge problems. Indian PM directly blamed that export of terrorism and counter currency from the other nations had only resulted loss for India. At the same time, Modi declared that all the bank notes of 500 and 1000 rs will be banned with effect from 30th December 2016. However an extra time of 3 months shall be allowed to exchange the bank notes from all the RBI outlets around the country. One will be needed to declare all of his income before trying to change the currency with RBI. The other option available to Indian consumers is that they can get the new notes from banks around the country. The government is strictly trying to ban all type of black money around the country. If you have any currency of 500 or 1000 rs, you can exchange it from the nearby bank within the next 50 days. First you will need to deposit the money and then one will be allowed to withdraw the counter cash with limits of 4000 rs per day till 21st of November and 10000 rs thereof. Bank are closed tomorrow on 9th of November. Please visit the banks from 10th of November will all the cash you have to deposit it with the banks. The only reason behind the ban of all the bank notes of value more than 100 and 200 rs was basically to fight the duplicate currencies and black money. This is the most strict action taken by Modi govt against terrorism till date. Its repetedly spotted that such nations export black money in India produced with their machines. Any specific ideas on WHY the government decided to ban the currency? Because of reports that Pakistan and Bangladesh are making duplicate currency. How does banning the currency help the fight against the duplicate currency and terrorism? Now arounf 30000 to 50000 crores of Duplicate Currency is circulating in India ( as per very least estimates). Rs: 500 and Rs: 1000 are very easily counterfieted and provide Terrorists lots of money. very bold and honest decision taken by govt ever in the history of India after abolition of privy purse. What do people in the UK do who have the existing old rupees brought back from there holiday to India…? Every time a new currency is introduced it has a routine statement attached with it that it will be impossible to counterfeit it. But it still happens, No one can gurantee that it wont happen with Rs 2000 note. It will take sometime but terrorist will figure out how to duplicate. Time will tell.